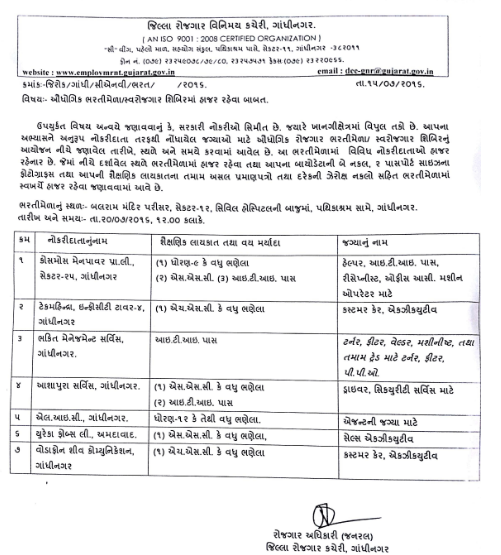 Employment and Training Department, Gandhinagar published Walk in Interview notification for recruitment for below mention posts open recruitment fairs for district of private units. For more details about this recruitment like, educational qualification, age limit, how to apply & more details as under. You can view official advertisement by following link. How to apply: Interested candidates will be apply & reach their along with original & attested copy of certificates like, educational & experience etc., passport size photograph & bio-data (3 to 4 xerox copy) to given below address. Venue: Balaram Mandir Parisar, Besides Civil Hospital, Opp. Pathika Ashram, Sector - 12, Gandhinagar.